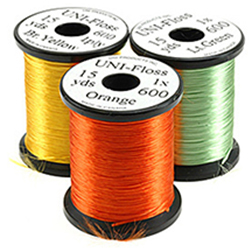 UNI-Floss is an all-purpose body floss manufactured of 100% rayon. 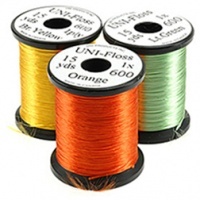 UNI-Floss is a single strand floss, 600 denier, strong and shiny. Salmon fly dressers (as well as other fly-tiers) will appreciate the wide range of 30 pattern matching colours : Beige, Black, Burnt Orange, Brown, Bright Yellow, Charcoal, Cream, Doctor Blue, Emerald Green, Golden Brown, Green Highlander, Gray, Dark Blue, Dark Brown, Dark Green, Dark Rust, Light Blue, Light Green, Olive, Orange, Pink, Pumpkin Orange (the Grey Ghost body), Purple, Royal Blue, Red, Rusty Orange, Rust, Tan, White and Wine. Available in spool of 15 yds.